1. Foreign reserves are down 28% since the end of 2012 (currently at $21.4 billion). Part of the decline was caused by lower gold prices, which impacted the value of Venezuela's bullion holdings. The country has $18 billion in short-term debt - with some $7bn coming due shortly. 2. Not surprisingly the rating agencies have downgraded the nation's debt with negative outlook (see Moody's statement). S&P called what is taking place in Venezuela "growing radicalization of the economy". 3. The recent effort to borrow dollars from private investors has not been received well. The central bank was only able to raise US$24.3 out of $100mm of securities auctioned. 4. 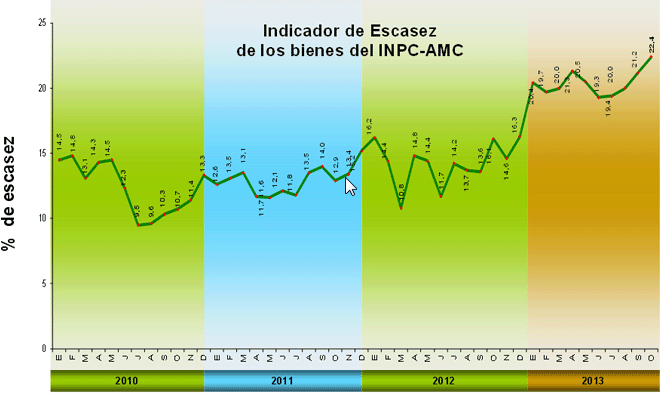 Venezuela's inflation rate spiked to 56.2% (not a typo) during 2013. 5. With the Venezuelan bolivar buying power collapsing, demand for dollars has accelerated. Black market dollars are now trading at some 1,000% above the official exchange rate. GS: - The supply of dollars to the economy at both the CADIVI [Commission for the Administration of Currency Exchange] and SICAD [the central bank] outlets have been insufficient to meet the large pent up demand for foreign exchange in the economy which is leading a significant pressure in the non-official market where the VEF/USD [bolivars per one dollar] is trading above 60 (or about a large 1,000 percent premium over the official 6.3 parity). 6. The government's answer to this out of control inflation has been to take over businesses, jail the executives/owners, and force discounting. Over 1000 businesses were ordered to cut prices. The government calls this their fight against "speculators". 7. 2013 was marked by empty store shelves (in part as a result of #6 above, as price controls often create scarcity). For those who remember the long lines and scarcity of products in Eastern Europe a few decades back, the situation in Venezuela is significantly worse. While the media has focused on the lack of toilet paper, the more critical issue is food. Items such as corn oil have become difficult to find. The central bank's so-called scarcity index (discussed here) reached new highs in 2013 - see chart below. President Nicolas Maduro's repose? He is simply blaming it all on what he calls “parasitic bourgeoisie” as he attempts to consolidate power (see post).